I’ve worn it in public a couple of times. At some level, I think I even convinced myself that it could provide subtle (subtle?!?) publicity: that people would see a word they didn’t recognize, Google it, and be led to this blog or our forthcoming book. After ten years of writing about Pietism, you’d think I’d be primed for that particular question. But instead I just muttered that it’s a kind of Christianity. I mumbled something I can’t remember, grabbed my coffee, went home, and changed my shirt. Now, I just went through a version of this with a magazine editor. For an article coming out this fall, she wanted a succinct definition of Pietism and the Pietist option, plus a short list of specific actions for those wanting to take the next step. It was an eminently fair request for an editor of a general audience publication trying to hold an author to a word count. So I’m sure she didn’t mean it this way, but going back and forth over that article revived an old worry of mine: that we’re publishing a book in an age of instant gratification, when few people read more than a short paragraph of anything written, and nothing can be that persuasive if it can’t be summed up in a few bullet points. Even as a blogger, I’m not really interested in cultivating that kind of readership, in having so superficial an impact. Part of our point there was to make clear right off the bat “that the aim of this book is not to produce Pietists!” If readers never embrace the term “Pietist” but nonetheless find themselves “better equipped to fulfill what we Covenanters call the whole mission of the church,” then Mark and I will be thrilled. But the yeast metaphor also underscores that change takes time. As every baker (or fan of The Great British Baking Show) knows, you can’t rush the rising and proofing of dough. After doing the hard work of mixing and kneading, you simply have to wait, for hours, as the yeast slowly, imperceptibly works its magic. The same thing is true with Pietism. 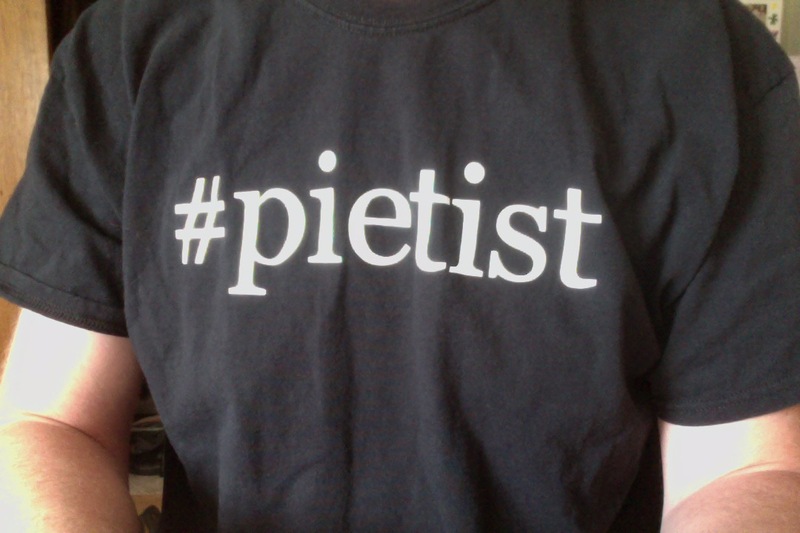 So whether it’s because you’re a reader of this blog, a friend or relative, or because you saw some goofy, gangly guy wearing a #Pietist T-shirt, please do read our (short!) book. The Pietist option is not a quick fix.